Late check-out may be possible by contacting our Reception and is subject to availability on the date of departure. (Be noticed that extra charges may apply.) A one night room fee will be charged if you would like to stay later than 16:00. We will be happy to keep your luggage in our storage room for free after your check out . Cancellation can be made without penalty 1 day before check in. However, cancellation terms could be differ according to reservation conditions - please check at the time of reservation. 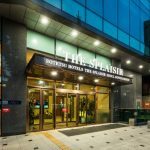 Guest rooms at the SOTETSU HOTELS THE SPLAISIR SEOUL DONGDAEMUN are all non-smoking rooms. There is nor extra bed. Baby cot for infants under 1 year are available free of charge, upon prior request. There is no computer in guest room, but computer use is available at the business corner (free of charge). Western and Asian buffet breakfast is available at our restaurant 'Le Chef' located on the 2F from 7:00am to 10:00am. Unfortunately the hotel doesn't have room service yet.